F&W's Kay Chun came up with four fantastic ways to serve ham this Easter, from a stuffed calzone to buttermilk ham flapjacks. Roll out 1/2 lb of pizza dough to a 10-inch round. On half of the dough, layer 4 oz each of thinly sliced provolone and ham. Top with 2 oz sliced Genoa salami, 2 roasted bell peppers and 1/2 cup chopped pimiento-stuffed olives. Fold over the dough; crimp to seal. Brush with olive oil and bake at 450° for 25 minutes. In a large skillet, cook four 1/4-inch-thick ham steaks in 2 tbs butter over moderate heat, turning once, until golden; transfer to plates. Add 1 thinly sliced leek and 1 1/2 cups water to the skillet and cook 3 minutes. 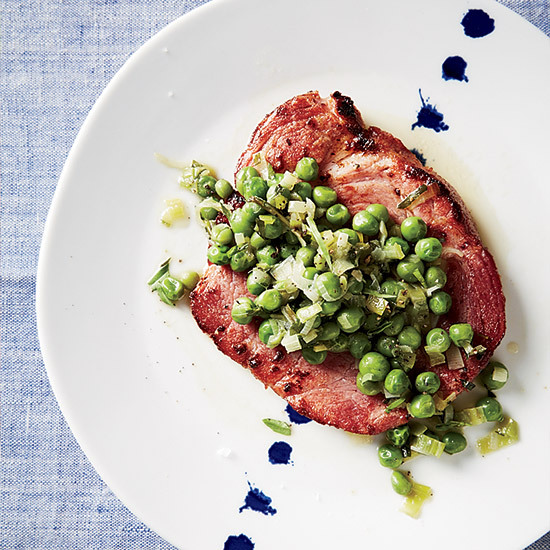 Stir in 10 oz thawed peas, 3 tbs chopped tarragon and 2 tbs butter; season and serve over the ham. Melt 4 tbs butter on a griddle. Cook 1/2 lb very thinly sliced ham until golden and crispy. In a bowl, whisk 2 large eggs with 2 tbs milk. Dip four 1-inch-thick slices of bakery white bread in the eggs, then griddle until golden; flip and top with 8 slices of Gruyère cheese and the ham. Cover and cook until the cheese melts. Top with basil. In a large bowl, whisk 1 1/2 cups corn muffin mix with 3/4 cup buttermilk, 1 large egg, 1 cup chopped ham and 1 sliced scallion. Scoop 1/4-cup mounds into a buttered nonstick skillet and cook, flipping once, until golden. Serve with maple syrup.